Update: We're in open beta! At this point you will be able to sign up / login with your LW 1.0 accounts (if the latter, we did not copy over your passwords, so hit "forgot password" to receive a password-reset email). Why bother with LessWrong 2.0? Update: We&apos;re in open beta! At this point you will be able to sign up / login with your LW 1.0 accounts (if the latter, we did not copy over your passwords, so hit "forgot password" to receive a password-reset email). This is the post for discussing the vision that I and the rest of the LessWrong 2.0 team have for the new version of LessWrong, and to just generally bring all of you up to speed with the plans for the site. This post has been overdue for a while, but I was busy coding on LessWrong 2.0, and I am myself not that great of a writer, which means writing things like this takes quite a long time for me, and so this ended up being delayed a few times. I apologize for that. With Vaniver’s support, I’ve been the primary person working on LessWrong 2.0 for the last 4 months, spending most of my time coding while also talking to various authors in the community, doing dozens of user-interviews and generally trying to figure out how to make LessWrong 2.0 a success. Along the way I’ve had support from many people, including Vaniver himself who is providing part-time support from MIRI, Eric Rogstad who helped me get off the ground with the architecture and infrastructure for the website, Harmanas Chopra who helped build our Karma system and did a lot of user-interviews with me, Raemon who is doing part-time web-development work for the project, and Ben Pace who helped me write this post and is basically co-running the project with me (and will continue to do so for the foreseeable future). We are running on charitable donations, with $80k in funding from CEA in the form of an EA grant and $10k in donations from Eric Rogstad, which will go to salaries and various maintenance costs. We are planning to continue running this whole project on donations for the foreseeable future, and legally this is a project of CFAR, which helps us a bunch with accounting and allows people to get tax benefits from giving us money. Now that the logistics is out of the way, let’s get to the meat of this post. 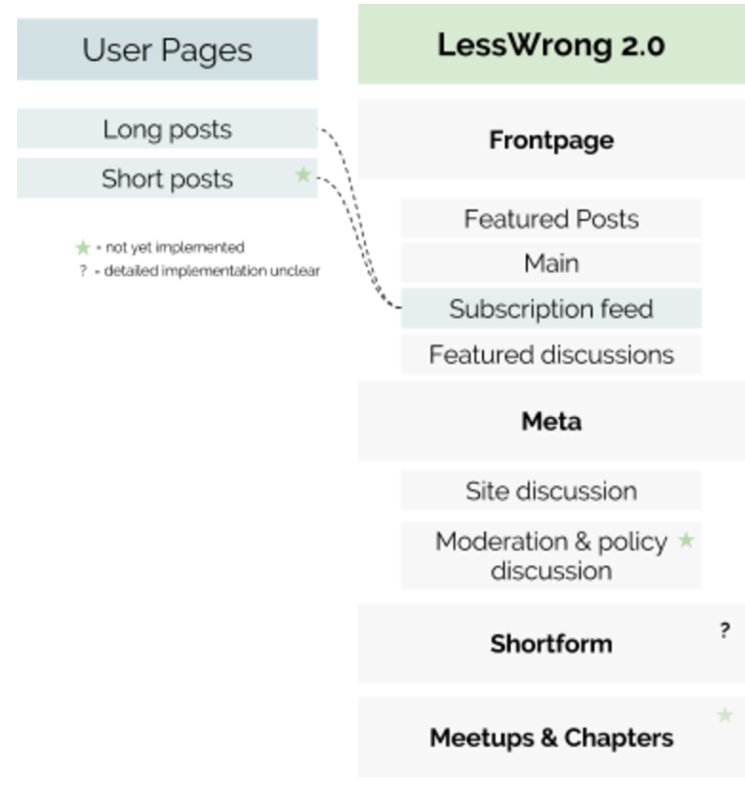 What is our plan for LessWrong 2.0, what were our key assumptions in designing the site, what does this mean for the current LessWrong site, and what should we as a community discuss more to make sure the new site is a success? I can talk about my mental experiences in a broad way, such that my personal observations, scientific evidence and reproducible experiments are all taken into account and given proper weighting. There is no narrow methodology I need to conform to to have my claims taken seriously. When making changes to LessWrong, I think it is very important to preserve all of the above features. I don’t think all of them are universally present on LessWrong, but all of them are there at least some of the time, and no other place that I know of comes even remotely close to having all of them as often as LessWrong has. Those features are what motivated me to make LessWrong 2.0 happen, and set the frame for thinking about the models and perspectives I will outline in the rest of the post. 1. The world is locked right now in a deadly puzzle, and needs something like a miracle of good thought if it is to have the survival odds one might wish the world to have. 2. Despite all priors and appearances, our little community (the "aspiring rationality" community; the "effective altruist" project; efforts to create an existential win; etc.) has a shot at seriously helping with this puzzle. This sounds like hubris, but it is at this point at least partially a matter of track record. 3. To aid in solving this puzzle, we must probably find a way to think together, accumulatively. We need to think about technical problems in AI safety, but also about the full surrounding context -- everything to do with understanding what the heck kind of a place the world is, such that that kind of place may contain cheat codes and trap doors toward achieving an existential win. We probably also need to think about "ways of thinking" -- both the individual thinking skills, and the community conversational norms, that can cause our puzzle-solving to work better. 4. One feature that is pretty helpful here, is if we somehow maintain a single "conversation", rather than a bunch of people separately having thoughts and sometimes taking inspiration from one another. By "a conversation", I mean a space where people can e.g. reply to one another; rely on shared jargon/shorthand/concepts; build on arguments that have been established in common as probably-valid; point out apparent errors and then have that pointing-out be actually taken into account or else replied-to). 5. One feature that really helps things be "a conversation" in this way, is if there is a single Schelling set of posts/etc. that people (in the relevant community/conversation) are supposed to read, and can be assumed to have read. Less Wrong used to be a such place; right now there is no such place; it seems to me highly desirable to form a new such place if we can. Now that I’ve given a bit of context on why I think LessWrong 2.0 is an important project, it seems sensible to look at what has been said so far, so we don’t have to repeat the same discussions over and over again. There has already been a lot of discussion about the decline of LessWrong, the need for a new platform and the design of LessWrong 2.0, and I won’t be able to summarise it all here, but I can try my best to summarize the most important points, and give a bit of my own perspective on them. 1. Eliezer&apos;s ghost -- He set the culture of the place, his posts are central material, has punctuated its existence with his explosions (and refusal to apologise), and then, upped and left the community, without actually acknowledging that his experiment (well kept gardens etc) has failed. As far as I know he is still the "owner" of this website, retains ultimate veto on a bunch of stuff, etc. If that has changed, there is no clarity on who the owner is (I see three logos on the top banner, is it them? ), who the moderators are, who is working on it in general. I know tricycle are helping with development, but a part-time team is only marginally better than no-team, and at least no-team is an invitation for a team to step up. ...I consider Alexei&apos;s hints that Arbital is "working on something" to be a really bad idea, though I recognise the good intention. Efforts like this need critical mass and clarity, and diffusing yet another wave of people wanting to do something about LW with vague promises of something nice in the future... is exactly what I would do if I wanted to maintain the status quo for a few more years. Any serious attempt at revitalising lesswrong.com should focus on defining ownership and plan clearly. A post by EY himself recognising that his vision for lw 1.0 failed and passing the batton to a generally-accepted BDFL would be nice, but i&apos;m not holding my breath. Further, I am fairly certain that LW as a community blog is bound to fail. Strong writers enjoy their independence. LW as an aggregator-first (with perhaps ability to host content if people wish to, like hn) is fine. HN may have degraded over time, but much less so than LW, and we should be able to improve on their pattern. I think if you want to unify the community, what needs to be done is the creation of a hn-style aggregator, with a clear, accepted, willing, opinionated, involved BDFL, input from the prominent writers in the community (scott, robin, eliezer, nick bostrom, others), and for the current lesswrong.com to be archived in favour of that new aggregator. But even if it&apos;s something else, it will not succeed without the three basic ingredients: clear ownership, dedicated leadership, and as broad support as possible to a simple, well-articulated vision. Lesswrong tried to be too many things with too little in the way of backing. I think Alexandros hits a lot of good points here, and luckily these are actually some of the problems I am most confident we have solved. The biggest bottleneck – the thing that I think caused most other problems with LessWrong – is simply that there was nobody with the motivation, the mandate and the resources to fight against the inevitable decline into entropy. I feel that the correct response to the question of “why did LessWrong decline?” is to ask “why should it have succeeded?”. In the absence of anyone with the mandate trying to fix all the problems that naturally arise, we should expect any online platform to decline. Most of the problems that will be covered in the rest of this post are things that could have been fixed many years ago, but simply weren’t because nobody with the mandate put much resources into fixing them. I think the cause for this was a diffusion of responsibility, and a lot of vague promises of problems getting solved by vague projects in the future. I myself put off working on LessWrong for a few months because I had some vague sense that Arbital would solve the problems that I was hoping to solve, even though Arbital never really promised to solve them. Then Arbital’s plan ended up not working out, and I had wasted months of precious time. Since this comment was written, Vaniver has been somewhat unanimously declared benevolent dictator for life of LessWrong. He and I have gotten various stakeholders on board, received funding, have a vision, and have free time – and so we have the mandate, the resources and the motivation to not make the same mistakes. With our new codebase, link posts are now something I can build in an afternoon, rather than something that requires three weeks of getting permissions from various stakeholders, performing complicated open-source and confidentiality rituals, and hiring a new contractor who has to first understand the mysterious Reddit fork from 2008 that LessWrong is based on. This means at least the problem of diffusion of responsibility is solved. 1. Eliezer had a lot of weird and varying interests, but one of his talents was making them all come together so you felt like at the root they were all part of this same deep philosophy. This didn&apos;t work for other people, and so we ended up with some people being amateur decision theory mathematicians, and other people being wannabe self-help gurus, and still other people coming up with their own theories of ethics or metaphysics or something. And when Eliezer did any of those things, somehow it would be interesting to everyone and we would realize the deep connections between decision theory and metaphysics and self-help. And when other people did it, it was just "why am I reading this random bulletin board full of stuff I&apos;m not interested in?" 2. Another of Eliezer&apos;s talents was carefully skirting the line between "so mainstream as to be boring" and "so wacky as to be an obvious crackpot". Most people couldn&apos;t skirt that line, and so ended up either boring, or obvious crackpots. This produced a lot of backlash, like "we need to be less boring!" or "we need fewer crackpots! ", and even though both of these were true, it pretty much meant that whatever you posted, someone would be complaining that you were bad. 3. All the fields Eliezer wrote in are crackpot-bait and do ring a bunch of crackpot alarms. I&apos;m not just talking about AI - I&apos;m talking about self-help, about the problems with the academic establishment, et cetera. I think Eliezer really did have interesting things to say about them - but 90% of people who try to wade into those fields will just end up being actual crackpots, in the boring sense. And 90% of the people who aren&apos;t will be really bad at not seeming like crackpots. So there was enough kind of woo type stuff that it became sort of embarassing to be seen there, especially given the thing where half or a quarter of the people there or whatever just want to discuss weird branches of math or whatever. 4. Communities have an unfortunate tendency to become parodies of themselves, and LW ended up with a lot of people (realistically, probably 14 years old) who tended to post things like "Let&apos;s use Bayes to hack our utility functions to get superfuzzies in a group house!". Sometimes the stuff they were posting about made sense on its own, but it was still kind of awkward and the sort of stuff people felt embarassed being seen next to. 5. All of these problems were exacerbated by the community being an awkward combination of Google engineers with physics PhDs and three startups on one hand, and confused 140 IQ autistic 14 year olds who didn&apos;t fit in at school and decided that this was Their Tribe Now on the other. The lowest common denominator that appeals to both those groups is pretty low. 6. There was a norm against politics, but it wasn&apos;t a very well-spelled-out norm, and nobody enforced it very well. So we would get the occasional leftist who had just discovered social justice and wanted to explain to us how patriarchy was the real unfriendly AI, the occasional rightist who had just discovered HBD and wanted to go on a Galileo-style crusade against the deceptive establishment, and everyone else just wanting to discuss self-help or decision-theory or whatever without the entire community becoming a toxic outcast pariah hellhole. Also, this one proto-alt-right guy named Eugene Nier found ways to exploit the karma system to mess with anyone who didn&apos;t like the alt-right (ie 98% of the community) and the moderation system wasn&apos;t good enough to let anyone do anything about it. 7. There was an ill-defined difference between Discussion (low-effort random posts) and Main (high-effort important posts you wanted to show off). But because all these other problems made it confusing and controversial to post anything at all, nobody was confident enough to post in Main, and so everything ended up in a low-effort-random-post bin that wasn&apos;t really designed to matter. And sometimes the only people who didpost in Main were people who were too clueless about community norms to care, and then their posts became the ones that got highlighted to the entire community. 8. Because of all of these things, Less Wrong got a reputation within the rationalist community as a bad place to post, and all of the cool people got their own blogs, or went to Tumblr, or went to Facebook, or did a whole bunch of things that relied on illegible local knowledge. Meanwhile, LW itself was still a big glowing beacon for clueless newbies. So we ended up with an accidental norm that only clueless newbies posted on LW, which just reinforced the "stay off LW" vibe. I worry that all the existing "resurrect LW" projects, including some really high-effort ones, have been attempts to break coincidental vicious cycles - ie deal with 8 and the second half of 7. I think they&apos;re ignoring points 1 through 6, which is going to doom them. When I read Scott’s comments about how there was just a lot of embarrassing and weird writing on LessWrong, I remember my experiences as a Computer Science undergraduate. When the median undergrad makes claims about the direction of research in their field, or some other big claim about their field that isn&apos;t explicitly taught in class, or if you ask an undergraduate physics student what they think about how to do physics research, or what ideas they have for improving society, they will often give you quite naive sounding answers (I have heard everything from “I am going to build a webapp to permanently solve political corruption” to “here’s my idea of how we can transmit large amounts of energy wirelessly by using low-frequency tesla-coils”.) I don’t think we should expect anything different on LessWrong. I actually think we should expect it to be worse here, since we are actively encouraging people to have opinions, as opposed to the more standard practice of academia, which seems to consist of treating undergraduates as slightly more intelligent dogs that need to be conditioned with the right mixture of calculus homework problems and mandatory class attendance, so that they might be given the right to have any opinion at all if they spend 6 more years getting their PhD. So while I do think that Eliezer’s writing encouraged topics that were slightly more likely to attract crackpots, I think a large chunk of the weird writing is just a natural consequence of being an intellectual community that has a somewhat constant influx of new members. And having undergraduates go through the phase where they have bad ideas, and then have it explained to them why their ideas are bad, is important. I actually think it’s key to learning any topic more complicated than high-school mathematics. It takes a long time until someone can productively contribute to the intellectual progress of an intellectual community (in academia it’s at least 4 years, though usually more like 8), and during all that period they will say very naive and silly sounding things (though less and less so as time progresses). I think LessWrong can do significantly better than 4 years, but we should still expect that it will take new members time to acclimate and get used to how things work (based on user-interviews of a lot of top commenters it usually took something like 3-6 months until someone felt comfortable commenting frequently and about 6-8 months until someone felt comfortable posting frequently. This strikes me as a fairly reasonable expectation for the future). And I do think that we have many graduate students and tenured professors of the rationality community who are not Eliezer, and who do not sound like crackpots, that can speak reasonably about the same topics Eliezer talked about, and who I feel are acting with a very similar focus to what Eliezer tried to achieve. Luke Muehlhauser, Carl Shulman, Anna Salamon, Sarah Constantin, Ben Hoffman, Scott himself and many more, most of whose writing would fit very well on LessWrong (and often still ends up there). But all of this doesn’t mean what Scott describes isn’t a problem. It’s still a bad experience for everyone to constantly have to read through bad first year undergrad essays, but I think the solution can’t involve those essays not getting written at all. Instead it has to involve some kind of way of not forcing everyone to see those essays, while still allowing them to get promoted if someone shows up who does write something insightful from day one. I am currently planning to tackle this mostly with improvements to the karma system, as well as changes to the layout of the site, where users primarily post to their own profiles and can get content promoted to the frontpage by moderators and high-karma members. A feed consisting solely of content of the quality of the average Scott, Anna, Ben or Luke post would be an amazing read, and is exactly the kind of feed I am hoping to create with LessWrong, while still allowing users to engage with the rest of the content on the site (more on that later). The first bottleneck for our community, and the biggest I think, is the ability to build common knowledge. On facebook, I can read an excellent and insightful discussion, yet one week later I forgot it. Even if I remember it, I don’t link to the facebook post (because linking to facebook posts/comments is hard) and it doesn’t have a title so I don’t casually refer to it in discussion with friends. On facebook, ideas don’t get archived and built upon, they get discussed and forgotten. To put this another way, the reason we cannot build on the best ideas this community had over the last five years, is because we don’t know what they are. There’s only fragments of memories of facebook discussions which maybe some other people remember. We have the sequences, and there’s no way to build on them together as a community, and thus there is stagnation. Contrast this with science. Modern science is plagued by many severe problems, but of humanity’s institutions it has perhaps the strongest record of being able to build successfully on its previous ideas. The physics community has this system where the new ideas get put into journals, and then eventually if they’re new, important, and true, they get turned into textbooks, which are then read by the upcoming generation of physicists, who then write new papers based on the findings in the textbooks. All good scientific fields have good textbooks, and your undergrad years are largely spent reading them. I think the rationality community has some textbooks, written by Eliezer (and we also compiled a collection of Scott’s best posts that I hope will become another textbook of the community), but there is no expectation that if you write a good enough post/paper that your content will be included in the next generation of those textbooks, and the existing books we have rarely get updated. This makes the current state of the rationality community analogous to a hypothetical state of physics, had physics no journals, no textbook publishers, and only one textbook that is about a decade old. This seems to me what Anna is talking about - the purpose of the single locus of conversation is the ability to have common knowledge and build on it. The goal is to have every interaction with the new LessWrong feel like it is either helping you grow as a rationalist or has you contribute to lasting intellectual progress of the community. If you write something good enough, it should enter the canon of the community. If you make a strong enough case against some existing piece of canon, you should be able to replace or alter that canon. I want writing to the new LessWrong to feel timeless. We created a section for core canon on the site that is prominently featured on the frontpage and right now includes Rationality: A-Z, The Codex (a collection of Scott’s best writing, compiled by Scott and us), and HPMOR. Over time I expect these to change, and there is a good chance HPMOR will move to a different section of the site (I am considering adding an “art and fiction” section) and will be replaced by a new collection representing new core ideas in the community. Sequences are now a core feature of the website. Any user can create sequences of their own and other users posts, and those sequences themselves can be voted and commented on. The goal is to help users compile the best writing on the site, and make it so that good timeless writing gets read by users for a long time, as opposed to disappearing into the void. Separating creative and curatorial effort allows the sort of professional specialization that you see in serious scientific fields. Of those sequences, the most upvoted and most important ones will be chosen to be prominently featured on other sections of the site, allowing users easy access to read the best content on the site and get up to speed with the current state of knowledge of the community. For all posts and sequences the site keeps track of how much of them you’ve read (including importing view-tracking from old LessWrong, so you will get to see how much of the original sequences you’ve actually read). And if you’ve read all of a sequence you get a small badge that you can choose to display right next to your username, which helps people navigate how much of the content of the site you are familiar with. The design of the core content of the site (e.g. the Sequences, the Codex, etc.) tries to communicate a certain permanence of contributions. The aesthetic feels intentionally book-like, which I hope gives people a sense that their contributions will be archived, accessible and built-upon. We do not want to discourage sketch-like contributions, and want to build functionality that helps people build a finished work from a prototype (this is one of the core competencies of Google Docs, for example). The second bottleneck is improving the signal-to-noise ratio. It needs to be possible for someone to subscribe to only the best posts on LessWrong, and only the most important content needs to turned into common-knowledge. I think this is a lot of what Scott was pointing at in his summary about the decline of LessWrong. We need a way for people to learn from their mistakes, while also not flooding the inboxes of everyone else, and while giving people active feedback on how to improve in their writing. If you write a post, it first shows up nowhere else but your personal user page, which you can basically think of being a medium-style blog. If other users have subscribed to you, your post will then show up on their frontpages (or only show up after it hit a certain karma threshold, if users who subscribed to you set a minimum karma threshold). If you have enough karma you can decide to promote your content to the main frontpage feed (where everyone will see it by default), or a moderator can decide to promote your content (if you allowed promoting on that specific post). The frontpage itself is sorted by a scoring system based on the HN algorithm, which uses a combination of total karma and how much time has passed since the creation of the post. If you write a good comment on a post a moderator or a high-karma user can promote that comment to the frontpage as well, where we will also feature the best comments on recent discussions. Meta will just be a section of the site to discuss changes to moderation policies, issues and bugs with the site, discussion about site features, as well as general site-policy issues. Basically the thing that all StackExchanges have. Karma here will not add to your total karma and will not give you more influence over the site. In addition to the main thread, there is a promoted post section that you can subscribe to via email and RSS, that has on average three posts a week, which for now are just going to be chosen by moderators and editors on the site to be the posts that seem most important to turn into common-knowledge for the community. There will also be a separate section of the site for meetups and event announcements that will feature a map of meetups, and generally serve as a place to coordinate the in-person communities. The specific implementation of this is not yet fully figured out. Many authors (including Eliezer) have requested a section of the site for more short-form thoughts, more similar to the length of an average FB post. It seems reasonable to have a section of the site for that, though I am not yet fully sure how it should be implemented. The goal of this structure is to allow users to post to LessWrong without their content being directly exposed to the whole community. Their content can first be shown to the people who follow them, or the people who actively seek out content from the broader community by scrolling through all new posts. Then, if a high-karma users among them finds their content worth posting to the frontpage, it will get promoted. The key to this is a larger userbase that has the ability to promote content (i.e. many more than have the ability to promote content to main on the current LessWrong), and the continued filtering of the frontpage based on the karma level of the posts. The goal of all of these is to allow users to see good content at various levels of engagement with the site, while giving some personalization options so that people can follow the people they are particularly interested and while also ensuring that this does not sabotage the attempt at building common knowledge by having the best posts from the whole ecosystem be featured and promoted on the frontpage. Another thing I’ve been working on to fix the signal-to-noise ratio is to improve the karma system. It’s important that the people having the most significant insights are able to shape a field more. If you’re someone who regularly produces real insights, you’re better able to notice and bring up other good ideas. To achieve this we’ve built a new karma system, where your upvotes and downvotes weight more if you have a lot of karma already. So far the current weighting is a very simple heuristic, whereby your upvotes and downvotes count for log base 5 of your total karma. Ben and I will post another top-level post to discuss just the karma system at some point in the next few weeks, but feel free to ask any questions now, and we will just include those in that post. I am also interested in having some form of two-tiered voting, similarly to how Facebook has a primary vote interaction (the like) and a secondary interaction that you can access via a tap or a hover (angry, sad, heart, etc.). But the implementation of that is also currently undetermined. The third and last bottleneck is an actually working moderation system that is fun to use by moderators, while also giving people whose content was moderated a sense of why, and how they can improve. The most common, basic complaint currently on LessWrong pertains to trolls and sockpuppet accounts that the reddit fork’s mod tools are vastly inadequate for dealing with (Scott&apos;s sixth point refers to this). Raymond Arnold and I are currently building more nuanced mod tools, that include abilities for moderators to set the past/future votes of a user to zero, to see who upvoted a post, and to know the IP address that an account comes from (this will be ready by the open beta). Besides that, we are currently working on cultivating a moderation group we are calling “Sunshine Regiment.” Members of the sunshine regiment that will have the ability to take various smaller moderation actions around the site (such as temporarily suspending comment threads, making general moderating comments in a distinct font and promoting content), and so will have the ability to generally shape the culture and content of the website to a larger degree. The goal is moderation that goes far beyond dealing with trolls, and actively makes the epistemic norms a ubiquitous part of the website. Right now Ben Pace is thinking about moderation norms that encourage archiving and summarizing good discussion, as well as other patterns of conversation that will help the community make intellectual progress. He’ll be posting to the open beta to discuss what norms the site and moderators should have in the coming weeks. We&apos;re both in agreement that moderation can and should be improved, and that moderators need better tools, and would appreciate good ideas about what else to give them. The open beta of the site is starting in a week, and so you can see all of this for yourself. For the duration of the open beta, we’ll continue the discussion on the beta site. At the conclusion of the open beta, we plan to have a vote open to those who had a thousand karma or more on 9/13 to determine whether we should move forward with the new site design, which would move to the lesswrong.com url from its temporary beta location, or leave LessWrong as it is now. (As this would represent the failure of the plan to revive LW, this would likely lead to the site being archived rather than staying open in an unmaintained state.) For now, this is an opportunity for the current LessWrong community to chime in here and object to anything in this plan. During the open beta (and only during that time) the site will also have an Intercom button in the bottom right corner that allows you to chat directly with us. If you run into any problems, or notice any bugs, feel free to ping us directly on there and Ben and I will try to help you out as soon as possible. What are your thoughts about the karma system? Does an eigendemocracy based system seem reasonable to you? How would you implement the details? Ben and I will post our current thoughts on this in a separate post in the next two weeks, but we would be interested in people’s unprimed ideas. What are your experiences with the site so far? Is anything glaringly missing, or are there any bugs you think I should definitely fix? Do you have any complaints or thoughts about how work on LessWrong 2.0 has been proceeding so far? Are there any worries or issues you have with the people working on it? What would make you personally use the new LessWrong? Is there any specific feature that would make you want to use it? For reference, here is our current feature roadmap for LW 2.0. And most importantly, do you think that the LessWrong 2.0 project is doomed to failure for some reason? Is there anything important I missed, or something that I misunderstood about the existing critiques? The closed beta can be found at www.lesserwrong.com. Ben, Vaniver, and I will be in the comments!